Including Children's Art and Drawing Products. On November 18, 1988, the President signed into law the Labeling of Hazardous Art Materials Act (Public Law 100-695). This law requires that all art materials be reviewed to determine their potential for causing a chronic hazard and that appropriate warning labels be put on those art materials found to pose a chronic hazard. The term "art material" includes "any substance marketed or represented by the producer or repackager as suitable for use in any phase of the creation of any work of visual or graphic art of any medium." (15 U.S.C. 1277(b)(1). The law applies to many children's toy products such as crayons, chalk, paint sets, modeling clay, coloring books, pencils, and any other products used by children to produce a work of visual or graphic art. The "Labeling of Hazardous Art Materials Act" (LHAMA) amended the Federal Hazardous Substances Act (FHSA) by adding Section 23 and designating the ASTM Standard Practice for Labeling Art Materials for Chronic Health Hazards (ASTM D-4236-88) as a regulation under Section 3(b) of the FHSA. The requirements of the LHAMA became effective on November 18, 1990. These requirements apply to art materials that are intended for use in the household or by children, which are initially introduced into interstate commerce on and after November 18, 1990. Those products which actually become a component of the work of visual or graphic art, such as paint, canvas, inks, crayons, chalk, solder, brazing rods, flux, paper, clay, stone, thread, cloth, and photographic film. Those products which are closely and intimately associated with the creation of the final work of art, such as brush cleaners, solvents, ceramic kilns, brushes, silk screens, molds or mold making material, and photo developing chemicals. Those tools, implements, and furniture that are used in the process of the creation of a work of art, but do not become part of the work of art. Examples are drafting tables and chairs, easels, picture frames, canvas stretchers, potter's wheels, hammers, chisels, and air pumps for air brushes. 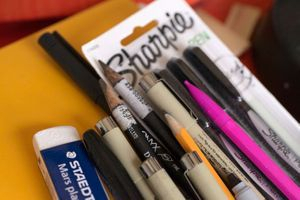 The Commission does not believe that Congress intended products in the third category to be considered "art materials." Therefore, as an enforcement policy, the Commission is not requiring that products falling in this third category comply with the standard for art materials. However, manufacturers still have the responsibility under the FHSA to assure that these products comply with any FHSA labeling or other requirements due to chronic toxicity or other hazards. Parents and others buying art materials, school supplies, and toys such as crayons, paint sets, or modeling clay should be alert and purchase only those products which are accompanied by the statement "Conforms to ASTM D-4236." The LHAMA does not change the fact that hazardous products are banned for distribution to young children, whether the hazard is based on chronic toxicity, acute toxicity, flammability, or any other hazard identified by the FHSA. There is an exception for art materials since they meet all three of the exemption criteria of Section 2(q) of the FHSA in that they: (1) require the inclusion of the hazardous substances for their functional purpose, (2) bear labeling giving adequate directions and warnings for safe use, and (3) are intended for use by children who have attained sufficient maturity, and may reasonably be expected to read and heed such directions and warnings.